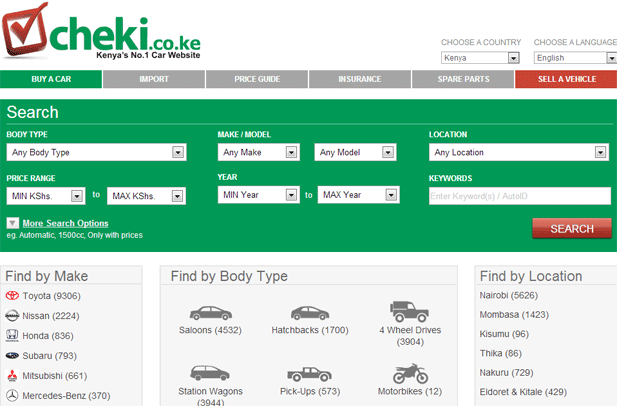 Less than three years after launch in Kenya where it started, used car classifieds Cheki now manages to sell approximately 3,000 to 4,000 cars a month. In Nigeria, where it started a year later, the founders say they sell even more cars. The startup also has operations in Ghana and Uganda where it lists about 1,000 cars in each market. Tanzania too. With East and West Africa in the bag, the startup is looking to expand car classifieds business into Southern Africa and they have raised US $20 million for it. Cheki has already gone live with local sites for Zimbabwe, Zambia, South Africa, Malawi and Rwanda, even though the sites don’t have any local listings yet. It’s not clear when they plan to make the sites fully operational. We’re guessing soon. In Zimbabwe they will compete with two main startups; Zimcarsales, which we wrote about here back in 2011, and classifieds.co.zw, Zimbabwe’s largest classifieds site. Cheki’s model is similar to both Zimcarsales and classifieds, that is basically charging individuals and companies to list their cars. They are Africa’s largest classifieds company. Carey Eaton, Co-founder of One Africa Media, has clarified in the comments that the investment they got is not for the purposes of expansion in Southern Africa, but “may pursue expansion of the existing businesses into more geographies if and when the opportunity arises”. They’ll need all the luck they can get in breaking into the Zim market…fact is classifieds.co.zw has become such a staple for Zimbabweans looking for anything online so it’ll be hard to get them to break that habit of only relying on classifieds and checking out other options such as Checki. Thanks for the mention but I should point out to your readers this is pretty speculative – the sites you mention have been live but inactive for two years now, and currently we have no active plans to launch in Zimbabwe. In our recent investment, whilst we may pursue expansion of the existing businesses into more geographies if and when the opportunity arises, its a bit of a leap to say that the intention of this investment was to expand into Southern Africa – that is not really accurate. So what is the $20 million for?